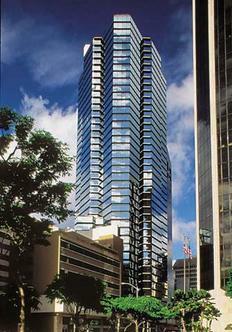 Downtown Honolulu's only all suite hotel. The ResortQuest at the Executive Centre is designed to accommodate the discerning business traveler. Spacious surroundings are combined with all the amenities they require. From the elegant marble and glass lobby to the welcome smiles at our front desk guests will know that their comfort is our only goal.All guest accommodations are spacious suites with separate sleeping areas and bathrooms with jacuzzi tubs. Executive one-bedroom suites feature kitchen facilities and washer/dryers. Business suites have a wet bar and refrigerator. Daily maid service is - of course - provided. Complimentary continental breakfast is served each morning in our 40th floor executive club lounge overlooking Honolulu Harbor and the Pacific Ocean.Serious business travelers prefer the location in the heart of Honolulu's financial district near legislative - government - and major corporate offices. A 24 hour business centre offers convenience. Guests can relax and re-energize with our 24-hour fitness centre with sauna - 20-meter swimming pool - outdoor whirlpool and sundeck. Bronsons - our lobby cafe - serves food with an island flavor in a relaxed setting.Numerous government and business offices are within walking distance. The Aloha marketplace and cruise ship terminal is only three blocks away. *** HAWAII*S NON-SMOKING LAW ***In the interest of the good health of all our guests,employees and owners, and in compliance with the StateLaw Act 295, ALL ResortQuest Hawaii hotels and condominiumunits managed by ResortQuest Hawaii are now designatedas Non-Smoking Accommodations effective immediately.